Ada Palmer, Renaissance scholar and science fiction author, on her new book, Seven Surrenders. 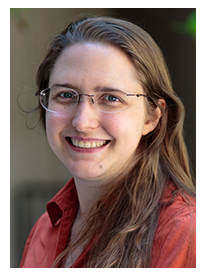 Ada Palmer, assistant professor of history, writes two kinds of books. In the scholarly category she’s published Reading Lucretius in the Renaissance (Harvard University Press, 2014), about how scholarly reading practices changed over the 16th century. To get at that, Palmer did a quantitative analysis of marginalia in manuscripts and printed books. In the science fiction category, she’s published two books in the Terra Ignota series: Too Like the Lightning (Tor Books, 2016) and Seven Surrenders (Tor Books, 2017). The third installment, The Will to Battle, will be released in December. At 57th Street Books in March, Palmer read an excerpt from Seven Surrenders. She also answered questions from David M. Berry, a writer and professor of medieval history at Dominican University, and from the audience (including the type of superspecific questions that mark the obsessive fan). Her comments below have been edited and adapted. Editor’s note: In April, Ada Palmer was named a finalist for the 2017 John W. Campbell Award for Best New Writer and Too Like the Lightning was named a finalist for the 2017 Hugo Award for Best Novel, one of the most prestigious awards for science fiction and fantasy. Describe the world of Terra Ignota. The novels are set in the 25th century and there are no longer geographic nations. There's a system of automated flying cars that are so fast, you can go anywhere in two hours. The whole world is commuting distance. You can live in the Bahamas, work in Tokyo, and have lunch in Paris. This is a perfectly reasonable day. Socially speaking, that collapses the world into the neighborhoods of a city. Very few people associate their identities with the place they happen to have been born. When you come of age, you choose which nation you feel most strongly represents you. How does your work as a historian translate to this project? In a lot of classic science fiction, no matter how far you are in the future, people have strong opinions about World War II and about America being heroic. We write futures that are obsessed with the 20th century. Some time periods are indeed obsessed with other time periods. I study the Renaissance, which was obsessed with ancient Rome. I decided to write a 25th century that was really excited by the 18th century. There’s almost no reference in your novels to the United States. Intentionally. Science fiction has been such an American-dominated genre. We always know what happened to the United States. When I was writing this, I would give chapters to my dad and ask him, what are you in suspense about? He always wanted to know, what happened to America? Is citizenship without geography actually plausible? Geographic citizenship is starting to make less sense as transportation and communication are so easy. I got the idea for this world when I was living at an academic institute in Florence. There were researchers from all over. Tons of them had kids. And within three months, they had created their own pidgin language out of the 15 different languages they spoke. These multinational families had ties not only to the two different nations that the parents were from but sometimes three or four. In one case five. These kids were going to come of age and fill out complicated paperwork to choose one of these nationalities. It seemed nonsensical, yet also saner than just having citizenship of the country where they happened to be born—particularly for the kid born while the parents were stuck on a layover in China. In science fiction more broadly, what’s exciting to you? For a long time science fiction has been written in English, translated into other languages, and avidly read. They've written science fiction in response but it hasn’t been translated into English. After the publication of The Three Body Problem (a science fiction novel by Chinese writer Liu Cixin, published in English by Tor Books in 2014), which had explosive sales and success, that opened the floodgates for Chinese, French Canadian, Eastern European science fiction. I haven’t had time to read all that much. The non-American science fiction that I’ve read comes from Japan—Japanese science fiction horror. In most haunting stories, there's a logic to who dies: you violated a rule and therefore the ghost killed you. Those rules are unspoken and subtle. That’s the case in Japanese horror, but the rules are different than in American horror. You'll be shocked at what happens, because you were predicting wrong, and you didn’t even realize you were predicting. Someone died because he offended against the spirit of that bookcase. And you're like, wait a minute, what? Bookcases don’t have spirits for us, but they do in Japan.